Well, not surprisingly none of my choices made the Top 10 and only four made the Top 50. There are some good choices in the list but I feel that the Top 10 is a predictable, safe and very Book Club-ish selection (Niffenegger, Hosseini, Zusak etc). 1. 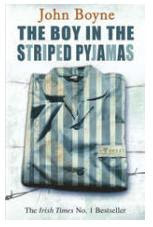 Boy in the Striped Pyjamas - John Boyne. Is it the best book of the noughties? probably not but it's still a good read and a worthy choice. 2. Time Traveller's Wife - Audrey Niffennegger. I haven't read it but those I know that have speak very highly of it. 3. Lovely Bones - Alice Sebold. Again, not something that's featured in my to-be-read pile. 4. The Girl With the Dragon Tattoo - Stieg Larsson. My favourite rant: I am still at a loss to understand how this book is as successful as it is. The first 150 pages were nothing more than a tedious info dump and the rest of the book became a very obvious mystery that any crime reader worth his salt would have solved very early on. I'm told the other two books in the trilogy are much better but I have no urge to read them after wading through the first one. 5. Curious Incident of the Dog in the Night-time - Mark Haddon. Beautifully written, simple story that repays re-reading. Good to see it in the Top 10. 6. The Kite Runner - Khaled Hosseini. I'd have put good money on this one featuring in the Top 10. A regular book-club choice, it was inevitable. 7. The Book Thief - Marcus Zusak. Is it any good? No idea. I got thirty pages in before I gave up. I just didn't get it (and there are very few books I don't actually finish). 8. A Thousand Splendid Suns - Khaled Hosseini again. As No. 6. 9. The Road - Cormac McCarthy. Marvellous, if depressing and gritty novel from one of America's finest writers. Good that it figured in the Top 10 too. 10. Atonement - Ian McEwan. I like McEwan's books, I just haven't gotten around to this one yet. The rest of the Top 50 is a bit less predictable and eclectic although I was hugely disappointed but not surprised to see the vastly overrated The Sea creep in at 44. The full Top 50 can be found here.